Adam Hamilton at Zeal is predicting Big Inflation Coming . My Comment : Well yes, that is convincing data. Indeed a perfect 15 out of 15 conditions experienced in the great depression are happening today as discussed in Humpty Dumpty On Inflation . Of course Humpty Dumpty can and does pretend that deflation is specifically about money supply, totally ignoring credit. And those same Humpty Dumpties were amazed by the collapse in commodities and were crushed shorting treasuries because they did not see this coming. My Comment : I am not sure what Hamilton means by "sustained". We have been in deflation for about a year, and maybe it lasts another, or five. Then again, perhaps we drift in and out of a slow growth recessionary period much like Japan for a decade. We have to take this one step at a time. Inflation and deflation are purely monetary phenomena. Inflation is not just a rise in prices, lots of things can drive prices higher. Inflation is the very specific case of a rise in general price levels driven by an increasing money supply. My Comment : That last sentence puts the cart in front of the horse. Inflation is not rising prices; rising prices are a result of inflation (an increase in money supply and credit). My comment : What deflationist has argued that commodity price declines are proof of deflation? Can I have a name? Most mainstream media is concentrating on prices. More to the point, no single indicator alone can constitute proof. However, 15 out of 15 symptoms one might expect to see in deflation should be ample proof for anyone. There is the humpty dumpty argument again. And again I reply that it is foolish to ignore credit (debt). Debt is actually more important than money simply because it dwarfs base money. And much of that debt cannot be paid back and that is why banks are failing. Come to think of it, I need to add bank failures to my list. That makes a perfect 16 out of 16 things. The key point in this rebuttal is that money supply does not have to shrink to cause deflation unless you insist on a humpty dumptyish definition that has no real world practical application. Here is a practical application: There is no money to pay back loans. What cannot be paid back will be defaulted on and the default avalanche has been triggered. Once an avalanche starts, it is impossible to stop. That avalanche of defaults amounts to deflation if it exceeds the expansion of money supply. Banks are attempting to hide the avalanche by not marking their books to market. Citigroup alone is sitting on over $800 billion in SIVs of dubious value. However pretending credit will be paid back does not make it so, just as ignoring an avalanche does not stop it. Hamilton goes on and on with straw man arguments about what deflationists believe. In practice I do not know a single deflationist who believes the strawman Hamilton is rebutting. Hamilton also talks about various money supply charts as if they are proof of inflation. Here is my rebuttal. Hamilton's definition shows there was massive inflation during the great depression, starting in 1931! Of course that is ridiculous. But it is what one must conclude if one defines inflation as an expansion of money supply alone. That chart shows why it is foolish to look at one indicator as proof of inflation. A more practical approach and a more practical definition, gives more practical results. 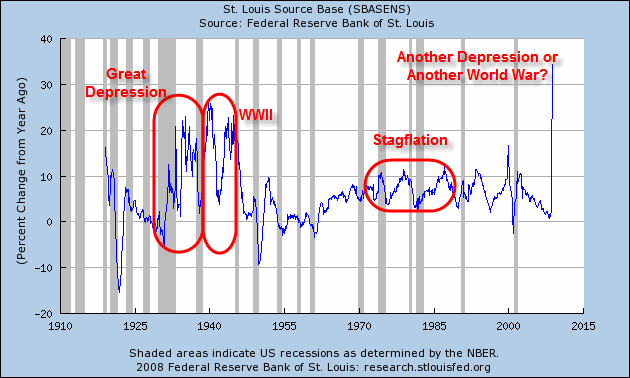 Soaring base money supply is not proof "Big Inflation Is Coming" soon, just as it was not proof that "Big Inflation" was coming in 1931. There cannot possibly be any other logical conclusion when confronted with the data. 01 Feb 09, 04:21 Inflation? so, inflation is unlikely to happen until more money is printed than the equivalent amount of credit that has dried up?